Read our helpful guide to second hand Kia Sportage. AA Cars works closely with thousands of UK used car dealers to bring you one of the largest selections of Kia Sportage cars on the market. You can also browse Kia dealers to find a second hand car close to you today. 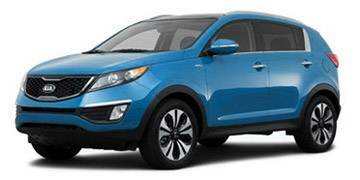 All used Kia Sportage on the AA Cars website come with free 12 months breakdown cover. Designed by the same man who brought us the Audi TT, the latest generation Kia Sportage is an understandably attractive car. Luckily however, it matches its looks with excellent performance, a spacious cabin and good equipment levels, all of which make it one of the leading crossover SUVs on the market. Unlike some crossovers, its handling and drive matches its sporty, capable looks, while on the road it is calm and comfortable, if not always the most refined. The 1.7 CRDi offers the best mix of performance and economy, but, being on the large side, fuel efficiency is closer to that an SUV; if at least a compact one. Like the rest of the Kia range, the Sportage is an impressive, understated car which is reliable, attractive, and one of the best value for money options on the market.